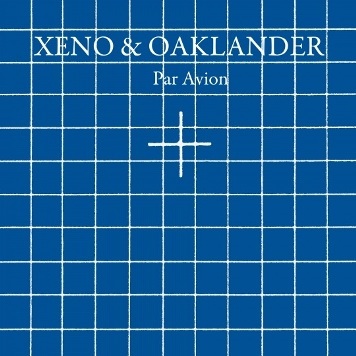 Minimal synth duo XENO & OAKLANDER release their fourth album ‘Par Avion’ this summer and as can be fathomed from the title, it sees them in comparative holiday mode. The songs have been described by the pair as “postcards of love for a cold age — shimmering moments from the present, romantic messages from the past, and love mementos for the future”. 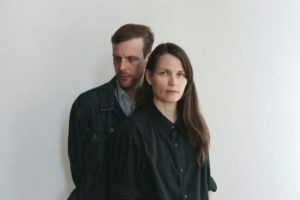 While Liz Wendelbo and Sean McBride retain their trademark combination of analogue trickery and unorthodox vocals, best showcased on ‘The Staircase’ from their last album ‘Sets & Lights’, this release on Ghostly International expands the template with a more expansive but still spacious sound. Icy string machines sit next to synergetic arpeggios and clattering drum machines in an exotically modern sound environment as both proven by the glistening offerings of ‘Sheen’ and ‘Providence’. 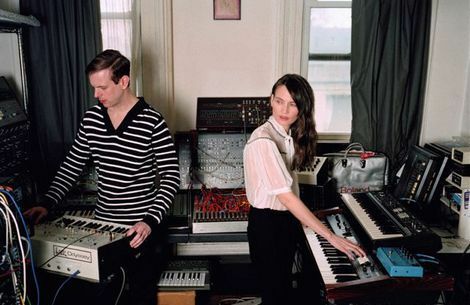 The duo supported JOHN FOXX & THE MATHS at London’s XOYO in 2011 and the Brooklyn based pair were notable for their array of vintage instrumentation that included several Roland SH101s, a Roland RS09, Korg KR55 Rhythm Box, TR808 and an Oberheim SEM. This complex armoury provided for a frantically tensile approach that included manually operated percussion fills and some additional authentic Europeanism in the form of Wendelbo’s wispy Franco / Norwegian charm. 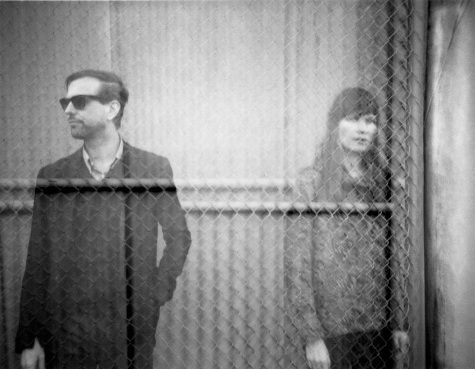 Your new album ‘Par Avion’ has been described as an ode to synesthesia. What conscious decisions were there to make it different from ‘Sets & Lights’? At the outset of recording this album, Liz was engaged in developing several perfumes, ‘Eau de Xeno’, hence synesthesia. There was never a conscious decision to do something different. There were of course newfound synthesizer processes that we wanted to employ and expand on. As our music largely grows out of live performance, this new material, in part, emerged out of the interstitial moments between the set of songs we were playing live, namely the songs from ‘Sets & Lights’. For instance, ‘Sheen’ grew out of the bridge linking ‘Sunday’ with ‘Blue’. After which we form them into structured pieces. So in a sense ‘Par Avion’ was squeezed out of the gaps of ‘Sets & Lights’. There is an internal logic integrated into not only the new album but also our entire catalogue. ‘Providence’ and ‘Reflections’ function as soundtracks within, and to this album and this logic. ‘Interface’ appears to have a more expansive audio spectrum than before? 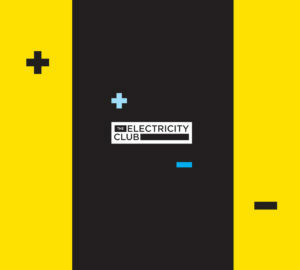 We were really interested in a sonic thickness – elongated and dense walls of frequency modulated harmonic noise mixed with glassy string clusters and voltage controlled analog delay feedback – not necessarily a move away from the age-old syncopated arpeggios of our older material, but a stretching out and a kind of liquefaction of these elements. The ‘Par Avion’ title track possesses a wispy dreamy romance alongside the more unorthodox sounds while the excellent ‘Sheen’ is quite bouncy yet smothered in ice and seems to nicely sum up the concept of the album. What would you consider the key tracks on ‘Par Avion’? I think more important than “key tracks” would be “key processes” and so I would say that FM synthesis is that key process. We used between 10 and 15 oscillators, we relied less on filters and patched the oscillators directly to the VCA (amplifier) only using analog delays to cut high frequency distortion. With this we were able to achieve everything from wall of sound dreamy guitar noise (‘Sheen’ and ‘Lastly’) to tremulous bouzouki timbres (‘Par Avion’). How would you describe your creative dynamic during writing and recording, particularly with regards to who takes lead vocals etc? Mostly conceived during the live performance ‘bridging’ of songs, the recording process is very straightforward, as I am controlling the rhythmic, bass and chordal elements, Liz is producing melodies and atmospheres, both with synthesizers as well as her voice. Liz typically sings to begin with, as I can then adjust the harmonic structure around her and she around me. All of the music is recorded in one take – apart from the fact that all of the instruments require the clocked master pulse (often coming from a Roland system 104 or TR 606 or Korg KR 55), we want the songs themselves to be a registration of a particular performance of a particular moment in time. Perhaps not the most apt comparison, but we would rather work with clay than with Legos. Have your various solo projects as LIZ & LASZLO and MARTIAL CANTEREL had much of an effect on your approach to this album? Liz sang on some of our friend Xavier’s songs (LASZLO, AUTOMELODI) and played string synths – as such I do not think it informs XENO & OAKLANDER so much, it’s a fun collaboration, whereas MARTIAL CANTEREL abides by, albeit solitarily, the same essential ethics and processes as XENO & OAKLANDER; so certainly there are a great deal of borrowed ideas, structures, and elements. However, when working with another, the art of listening to the other becomes much more critical in importance – a synergy, a counterpoint. Also, Liz brings to X&O an aesthetic vision, a synesthetic vision – so her solo work with perfume, film and photography is central to our project’s universe. How did you originally become interested in forming a project consisting exclusively of electronic instrumentation? Who were your main influences musically and culturally? In the early 90s, I acquired a Korg Monopoly, Oberheim SEM and a SC Prophet 600, a SC Tom and an SC Drumtraks. I realized that there were archaic, pre digital ways to interface these instruments with one another. So simply as we acquired more, the studio became one large holistic, interfaceable, synergistic instrument – to borrow a term from Chomsky’s generative grammar, a discrete infinity of possibilities. There was little need to bring in other instrumentation outside of the realm of voltage control – what little we have brought in over the years (trumpet, guitar, ethnic percussion) has been a playful highlight of the very thing it is playing alongside of – the synth studio. As goes influence, everything from Baroque to 60s psych to 80s Italian industrial and beyond… We are particularly interested, though, in the music and those projects which involved similar synthesizers to what we use, especially those who utilized synthesizers during their nascence – ca. 1964 to 1984. You’ve acquired a Serge Modular? Why one of those as opposed to any other modular and how have you found it to use? I acquired the Serge 6 years ago and for me as, a unit, it is the most densely complex synthesizer I have ever used. The synthesizer wizardry lies in that the modules can have a multitude of different functionalities, its size, the mode of patching (banana jacks) and most importantly, the incredibly stable tuning of the unit. The Wave Multiplier section within my Serge system is perhaps a favorite function – sine waves rectified at odd number harmonic intervals. 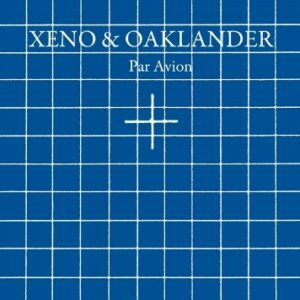 The Roland SH101 appears to be one of your favourite instruments; what is it about is versatility / limitations that makes it an important part of the XENO & OAKLANDER sound? The SH101s – we have 5 – for me, are used simply as controller keyboards to play either the Serge, 2600s, Eurorack system etc., and Liz largely uses them for atmospherics, noise percussion, and auxiliary bass overtones. The SH101’s greatness lies in the fact that it is so lightweight, and as such, makes touring with a complete analogue synthesizer set-up possible. The clockable arpeggiator and the built-in scratchpad sequencer are added perks. You’ve acquired a vast number of synths and devices over the years, are there any interesting stories you can tell us with regards some of their little eccentricities and quirks? I brought the Serge with me to Copenhagen in 2010 as checked-in baggage, and after unpacking it and soundchecking, I realized that the oscillators were as I left them in New York – perfectly tuned. Is there an instrument you’d like to have that you don’t already own yet? More Serge modular and maybe a Wersi Alpha DX 300. You’ve adapted the live set-up to use more modern technology to control the older synths. Did you have any artistic manifesto dilemmas to consider or was it a no-brainer in terms of practicality? As we want the distinction between studio practice and live performance to collapse as much as possible, physical weight, size and durability become key. For the last three years we have used a hodge podge of eurorack modules fitted into a very portable carrying case. This allows us to match, let’s say, the functionality of the Serge or Roland System 100 in a relatively inexpensive and portable unit. While the manufacturers of yesteryear used higher calibre electronics and materials (military grade circuitry, leather tolex, brushed steel) the simple dimensions and weight of these instruments precludes using them live without a substantial road crew, an army of assistants. Also within the eurorack format, one can very easily customize and swap out the modules within a case to the needs of the day – MARTIAL CANTEREL uses one grouping of modules, Xeno another. I have toured with the Serge and ARP Odyssey several times – the Serge’s power supply weighs more than the synth itself – however they no longer provide the most bang for what one human being can carry – especially across Europe – trains, planes, automobiles. So are you darkwave, synthpop, electro, EDM or minimal synth? Do classifications such as these really matter in the end? These terms do not matter to me. They are only important for the Historicists and as eBay LP auction keywords. We’ve used the term ‘Minimal Electronics’ over the years to describe our music, although with our new album ‘Par Avion’, the minimal has perhaps changed to maximal.